So I have been thinking about storing some water for a number of reason; drought, power outage, SHTF, etc. I usually keep two 30 packs of bottled water but would like to beef up my supply a little since I have more room. I've looked at Lexington container Co. and saw these Scepter Water Cans. I would keep my several cases of water along with a few of these cans. 1. Are these cans worth while? I don't want some piece of crap that will come apart or contaminate the water with toxins. 2. Do I need to put any addictive or things in the water cans for storage? My wife and I are water drinkers anyway. Just wanted to add some more just in case. The containers would be in the garage which is usually cool but never exposed to extreme conditions. Bottles from the store. Fast grab and go. Rotate as needed. 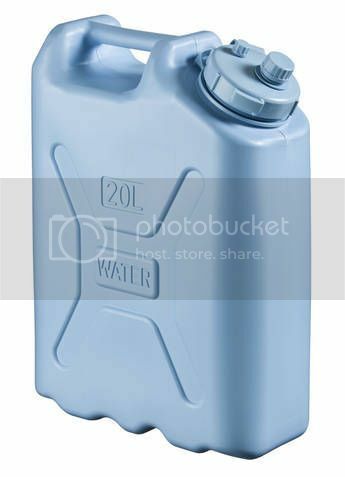 Water cans 5-6 gallon blue blitz cans- had aquatainers but the all split at the spigot (after 8-10 years) . Water barrels 15gallon.- flush rotate yearly. Large water tote- flush..clean..fill yearly. I just use tap water..and add bleach...and walk away. I bought a few water-cooler 5 gallon jugs at Home Depot a few years back when they were predicting a particularly nasty storm. They've been in the basement ever since. I figure that if the storm ever comes - I'm covered by the larger stock of bottled water I now rotate through regularly, and the jugs will just add flush supply for the bathroom. I generally keep 6 or 7 cases on hand and rotate through them about every 2 to 3 weeks. "The Angels Shall Protect You"
Scepter are G2G, LCI water cans are as well. Scepter exceeds milspec as far as fit and finish. The prices reflect this. I went with LCI, I don't regret it.